Netherealm's new fighter, Injustice: Gods Among Us, is looking more and more promising especially from the weekly Battle Arena videos. 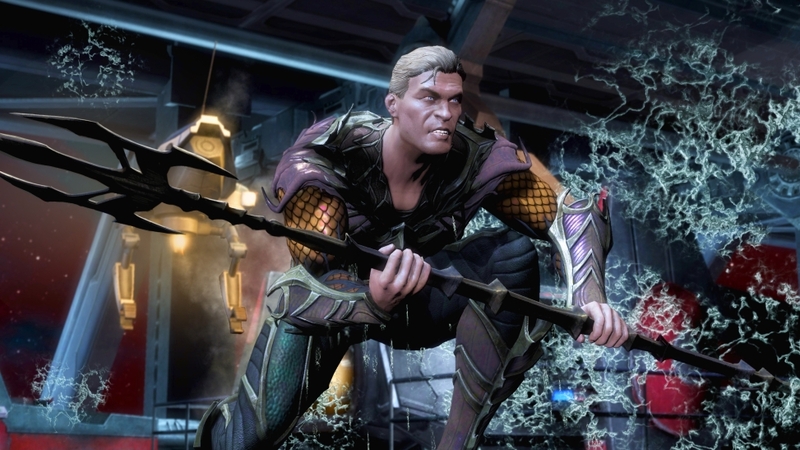 NetherRealm Studios, formerly known for Mortal Kombat, has worked with the DC franchise before with mixed results. This time however they are putting their resources in their entirety in the DC Universe side of the spectrum, including tweaking the combat system and narrative to fit the property. NetherRealm has been marketing the balls out of this game with their recent and ongoing "Battle Arena" video series which allows players to vote on their favorite heroes in a tournament bracket. They also have a 52 series dedicated to the Injustice universe that are set as prequels to the game's events. For me however, the most exciting part of this game is not even the combat system, it is the narrative. As a huge comic book fan, I am extremely curious at to what will unfold during the story that NetherRealm has crafted because of what I have seen from the reveal trailers and more specifically the story trailer looks impressive. The story trailer shows a large military force, whose identity is still uknown to me though I believe it is Superman's regime, and Batman and Oliver Queen (Green Arrow) working together with Harley Quinn. If you know Oliver and Batman, they both have the same views on their cities and fight for the little guy so this combo has me leaping with joy. I am extremely curious as to how similar/different NetherRealm's take on the characters compare with their comic book counterparts and their chemistry with other characters from the universe, because everyone seems to be at everyone else's throats. Their full roster has yet to be revealed, but as it stands it strong filled with big names such as Batman and Superman, but also less known characters like Solomon Grundy and Shazam. We also are supposed to get cameos in the story even if they're not playable. For example, in the Arkham Asylum stage, Riddle, Penguin, and Killer Croc all make brief, but hilarious cameos. The game also boasts an extremely impressive fighting engine, allowing for absurd detail in the character models. The player to see the seams in Superman's suit and each individual scale in Arthur Curry's outfit. NetherRealm stated the engine, "pushed the boundaries on our graphics engine forward with industry leading innovations. They added that the game features a revamped lighting solution, enabling more dynamic lighting in terms of characters and environments. A new "character material" system was created to portray characters with increased graphical detail. Injustice also utilizes a multithreaded rendering engine, allowing the game to display approximately three times the amount of objects on screen at a single time than Mortal Kombat." The environments are destroyed in the background, from the characters devastating attacks to one another, and the environment will remain crumbled as you fight in it, as will the interactive objects I mentioned earlier. Character animations are superb, and the level of detail featured in each attack is fantastic. i.e. Solomon Grundy pulling knives out his back to attack only to sheath them back into his flesh for reuse. The voice acting sounds great from what I have heard, obviously Kevin Conroy as Batman is a must, and Micheal Rosenbaum as The Flash is easily recognizable as well, but the rest of the cast which for the most part is taken from Batman: Arkham City are features as well. I can't even remember the last time I was this excited for a fighting game's story. NetherRealm has been known for creating coherent, albeit B-grade movie, stories to their fighters, but you can tell that they really love the DC Universe. The comics that have been released thus far for the 52 series has me foaming at the mouth for more. This is an alternate universe that I want to see unfold and it is coming in the form of a fighting game. The recent Battle Arena shows that NetherRealm really cares about pleasing fighting and DC comic book fans alike. Whether they can satisfy both has yet to be seen. Let's just hope they don't pull a clone saga and disappoint everyone. UPDATE: Sinestro and Hawkgirl have both been revealed as playable characters. If both of these characters are involved in the game's story, this game has gotten more epic in scale than previously, escpecially in Sinestro's case. I am a huge Green Lantern fan, so for Sinestro to be revealed as a playable character made me very excited. Thaan Sinestro for those who don't know is the founder and leader of The Sinestro Corp. Their power source is one of Fear: "In blackest day, in brightest night, Beware your fears made into light Let those who try to stop what's right, Burn like my power*... Sinestro's might! Seeing how he fits into the game's narrative will be interesting to see, and maybe we'll get to see some Green Lantern Vs. Sinestro Corp action. Hawkgirl, or Shiera, from Thanagar, was also revealed today wielding her electric mace. Hawkgirl has become an invaluable teammate for the Justice League, and was expecially featured in the animated series with a fantastic three episode arc called "Star-Crossed" which gave her the spotlight she deserved. These are two great additions to the roster and it will be interesting to see how they fit into the narrative (Hopefully not forced) and how their playstyles differ from the rest of the roster.